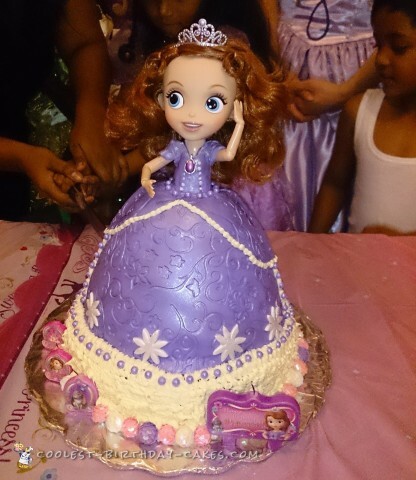 My daughter, Seanna, wanted a Princess Sophia birthday cake for her 4th birthday and I promised her that I could do it. It was not easy, since I am not a professional and not very steady with my hands. It took me a few long hours and lots of back pain to complete this cake. My husband had a hard time looking for the correct size of Sophia doll for the cake topper and had to go back and forth a few times to get it. Working with fondant is very tricky if you’re not used to it and I had to ask my mom who is a seamstress to guide me in cutting out the skirt pattern correctly. In the end my baby was so impressed with our creation that she took all of the guests to see her cake first. Lots of guests actually thought that we had ordered the cake from a cake shop (meaning they thought it was done professionally). I received lots of praise and it was all worth it just for the smile and awe on my baby’s face. Birthday cake idea Posted by Bharti A.